According to the American Heart Association, over 47 million Americans have metabolic syndrome. That is approximately one out of every six people. Every health-fitness professional will encounter diabetic clients. This course will help prepare you to effectively work with these clients on many levels. Scenarios are included to help you prepare for inevitable diabetic incidents with clients. 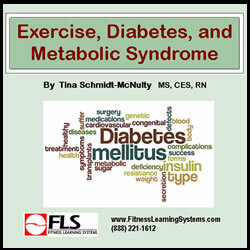 Identify and discuss 5 risk factors for metabolic syndrome. Recognize signs and symptoms for high blood pressure and diabetes. Discuss the causes of metabolic syndrome. Discuss statistics, symptoms, and 3 stages of diagnosis for diabetes. Identify and discuss 3 common forms of diabetes. Describe 5 components for managing diabetes. Discuss physical activity goals and exercise and weight management recommendations for diabetes. Explain 6 ways to prevent diabetes and metabolic syndrome including lifestyle changes.